Leave a comment below to sign-up. You can list the books you intend to read if you’ve already decided. For those with blogs: write a post on your blog about the challenge (with or without your list) and link to this post. I will publish lists of reading materials under various themes until I tire of the process. Please contact me at kinnareadsATgmailDOTcom if you need any help. There’re probably be a readalong or two. I will announce those in the coming months. That’s it. 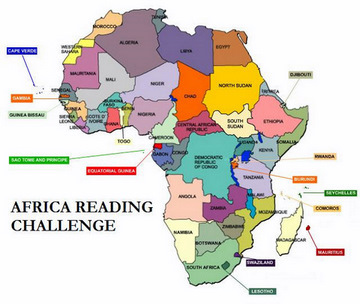 Let’s enjoy reading for the 2014 Africa Reading Challenge. A number of years ago when I taught freshmen English, everyone had to read “Things Fall Apart”. Some loved it, some hated it, some remained unsure. However, the next year when questions showed up about it on the PSAT, I felt totally vindicated. Now, years later, when I encounter these former students, even those who did not like reading it very much, they remember the main character, even his name. I ask them if they remember the names of main characters of other books they have read and most do not. Now I have several African selections for my senior students to choose from to read. Most seem uninterested, but a few do read these and hopefully expand their horizons at least a bit. And finally, here is my fifth entry for the 2014 challenge. Better late than never? Here’s my fourth book of the 2014 challenge. I didn’t quite make the 2014 deadline, but I’m still going to complete the five book challenge! What a great challenge – pity I found out about it so late in the year, not sure I can complete it in 3 weeks! Will there be one next year? Yes, it will continue next year. That’s great news. Thanks for the follow too – and I guess you will have seen I decided to get stuck into the challenge this year anyway. I’m excited about it – so many new books to check out, plus an opportunity to reread old favourites and see if they’ve stood the test of time. I’m looking forward to reading what other people have read along with their reviews. Hi Kinna – I finished the challenge but I’d like to go further. And I’ve been really remiss in posting progress – sorry. Book 3 of 5 for me: Lagoon by Nnedi Okorafor. Fantastic! I’ve only just recently discovered this challenge, but having read both Purple Hibiscus and Americanah – and really enjoyed both of them – in the last couple of months, I thought it would be good to discover some more books by African writers. I’ve got four or five more in mind but am not sure I’ll manage them all by the end of 2014, but it can continue into the new year as my own personal challenge if I don’t. I’ve tried to choose a balance of countries, original languages, male and female authors, and a mix of old and new, novels, short stories and non-fiction. Looking forward to it. I just posted my first African Book Challenge post at the above address. Thanks again for hosting this challenge! I know its late in the year but I would like to join this challenge. Hi, I just found this challenge and coincidentally I have already read one book by an African author this year: Things Fall Apart. I will do some more research as to books to read. Post will be going up within the week! I’m currently reading Hope and Other Dangerous Pursuits, and I absolutely love it! I’m so glad it was recommended here because I don’t think I would have thought to pick it up otherwise. Posted my review of A GRAIN OF WHEAT, by Ngugi Wa Thiong’o. An amazing book shifting how we think about war. So it taught about it a couple of times. should I participate or not? Until I realize I have already read more than 5 books since january 2014. I sign up for this challenge. im up for ths challenge….African authors are thee BEST! Posted my review of Zenzele by J. Nozipo Maraire. Loved it. Excellent statement of how traditions matter. i just finished reading Death and the Kings Horseman and am very impressed. See my review. I’m another one joining in half way through the year but am really looking forward to this challenge. I know the year is half over, but I’d still like to participate! I just picked up a copy of “Things Fall Apart.” Can’t wait to get started! Lovely project. I thought it required one to read 53 books in a year, one per country, and I never manage to read more than 30 (usually more likely 24) books per year. I already completed your challenge this year, I guess, since 6 of my 12 books I’ve read so far were by African writers. Great blog. What a great blog and challenge! Sign me up, please! I’ve already read quite a few books by African writers (and have posted on a few in my blog), but there’s plenty more out there to read. I’m not sure yet which ones I’ll do. I would like to enter the challenge. Coming to the dance late… but I would definitely like to join the challenge. Will get a blog up soon with my choices. I live in South Africa, what a great idea. I am in. I have read 2 excellent non-fiction books by SA writers this year. “To catch a cop, the Paul O’Sullivan Story” by Marianne Thamm; “Dances with the Devils” Jaques Pauw and 1 fiction by Deon Meyer “Devils Peak”. I would encourage readers to give Zakes Mda a try, awesome. I am a little late to the party but really up for the challenge. I am really interested in revisiting ‘Second Class Citizen’ by Buchi Emecheta a book I read as a teenager; finally reading ‘Americanh’ by Chimamanda Adichie, ‘Ghana Must Go’ by Taiye Selasi and ‘We need new names’ by NoViolet Bulawayo amongst others. Thanks for doing this challenge; it’s definitely a way to keep me accountable! I’m in. Thank you for hosting this challenge. I will be looking at picture books from Africa as well as some biographies. I will check with my local library. i wonder why African books are produced outside Africa not to talk about how expensive they are. I must say however that if one has got the dough, buying and reading African writings is the most classic thing ever. Any one has African books to lend, i will be grateful!!! The list goes on… I really like the look of Season of Migration too and may start with that to get into the swing of things. All suggestions welcome! And I read Scenes From a Provincial Life by J.M. Coetzee – -a trilogy of three novellas, actually, a fictionalized biography. Also, I read We Need New Names by NoViolet Bulawayo and am now into The Fear by Peter Goodwin – also Zimbabwe – nonfiction. I’m looking seriously at the older book, Agaat by Marlene van Niekirk (South Africa) as well as some other newer ones – perhaps a couple from the northern areas. Just finished Zebra Crossing by Meg Vandermerwe about a young woman with albinism from Zimbabwe who flees to Cape Town with her brother on the eve of the World Cup. Generally I liked it–an interesting portrayal of challenges illegal immigrants face in South Africa, especially someone with albinism–although I kind of felt the ending was rushed…although that may be because I was being interrupted a lot for the last several pages. Sounds like a challenge that I “need”, as I’m trying to read a book from each country in the world (in the extent that it is possible). I will be participating. I just started reading Akata Witch and am looking forward to jumping into some of the other titles you mentioned above. Thanks for organizing this! I blog at Rich in Color and Reading Through Life so reviews may show up at one or the other or in Goodreads. I didn’t know you’ve launched this. I am in. Which is to say in the next few months I will rush in here to tell people I have completed the challenge, which in itself will be no challenge. *weeping*. Just finished “We Need New Names” by NoViolet Bulawayo (2013 / Zimbabwe) and highly recommend it. Want to read Peter Godwin’s “Fear,” a nonfiction about that country and Robert Mugabe. Challenge accepted ! I will soon pingback a list of books. Oppong, please don’t feel challenged by the Challenge, at least not too much. I will compile a special book list for you, to answer your question, and will post it here. Stay tuned and thanks for participating! This year, I resolved to read more. So this is coming a good time. Please sign me up. I will share my reading list on my blog as soon as decided. I must really educate myself about fiction writers from my continent. I’m glad. Looking forward to you sharing what you learnt. Happy reading and thanks for joining the challenge. No idea what else I’m reading yet, but I’m definitely doing this. Maybe I’ll begin with Taiye Selasi’s ‘Ghana Must Go’. Thanks for hosting this Kinna! I read and loved Ghana Must Go but I’m yet to post a review. A good place to start. Thanks for joining the challenge! You have here a number of new-to-me Francophone writers so I eagerly await your reviews. Thanks for participating in the challenge. I’m in, please! My sign-up post (including a list of possible books) is here: http://returningreader.wordpress.com/2014/01/18/2014-africa-reading-challenge/. Thanks for the challenge! Thanks for joining the challenge. Looking forward to reading your reviews. But you know how lists are … always subject to change. I do know how lists are. But I hope you get to read Mahfouz’s Akhenaten since I’ve never heard of it. I just posted my first book for the Africa Reads Challenge on my blog. Distant View of a Minaret, by Alifa Rifaat. http://wp.me/p24OK2-10y I loved the short stories from inside Egyptian Muslim women’s worlds. I said I wasn’t going to list my proposed list of reads, but without trying I have made one. The five books on Kinna’s “African Women Writers Syllabus that I haven’t read. I love love love Distant View of the Minaret, one of my favorite all-time books from the Continent. Of course, I appreciate your focus on the women writers. Very nice reading list! Challenge accepted. I read a good amount of African literature, but mostly from west Africa (I live in Burkina Faso) and stick mostly to the “classics.” So my plan is to expand outside of that, starting with “Petals of Blood” by Ngugi wa Thiongo’o. Thanks for hosting this! I don’t think I’ve ready anything by a Burkinabe writer. Do share if you know of any. Ngugi is a good place to start. Thanks for joining the challenge. I’m in. i’ve read a fair amount of African literature, but not those on your list, so I think that would likely be a good place for me to start. I will posting more lists soon so you could find something new on those as well. Thanks for joining the challenge. Everyone should add this important reading site to their Browser. Furthermore, this reading challenge is a good way to further expand your reading experience. Go for it! I intend to make certain there are at least five books on my 2014 Reading List. You’ve come up with some great ideas to challenge us, Kinna. Thanks for hosting this again. How timely. Eager to learn about what you read. Thanks for participating. I’m in!! I took part last time around and had a blast! Can’t wait to get started!! I hope you enjoy this year’s challenge. Looking forward to hearing about what you read. Thanks! Such a good bargain. Enjoy! I’m in. Nuruddin Farah, Wole Soyinka, Seffi Atta, Binyavanga Wainaina, Paul Muyburgh are on my list. Can I add my own book, A Quiet Kind of Courage? An excellent list of authors you have here. And thanks for the introduction to your book. Thanks for participating in the challenge. I’m in. Laurie in North Carolina, U. S. of A. But you probably already knew where NC is because geographical literacy is so high outside the U.S. Yes, we do know where NC is. Thanks for participating and enjoy reading your selected books! Definitely I am in, though I am fairly sure I will end up with more than five “African” books – at least given my reading over the last few years! Will also post something about the challenge as well. Thanks for the support, Nina. I look forward to what you read. I’m in! Now to find a good bookstore in Accra, any suggestions? Try both the EPP and Campus Bookstores at Legon. Also try Vidya Bookstore, which is on 18th Lane in Osu. There are some African and Ghanaian books there. Which Ngugi book? I want to read Matigari this year, so you’re in good company. Plus, I’m mulling over a read-a-long of Wizard of the Crow. Thanks for participating. I’m definitely in! No list for me, there are too many books I want to read and I can’t choose. Haha, I do hope you make a selection soon. Given your reading global efforts, I have no doubts that you’ll find something wonderful. Thanks for participating. I dare not join the challenge but will be watching with great interest. Its so true that its hard to find some of these authors – many of the books are not available in English or if they are, it’s really expensive. Hi! Sounds like a fun challenge. I’ve read quite a few books by African authors but was looking to explore further. As it happens I bought ‘Looking for Transwonderland: Travels in Nigeria’ by Noo Saro-Wiwa yesterday, so I’ll start with that one and go from there. I’ll link to a review on Goodreads if that’s ok.
A link to a review on Goodreads will be fine. Thanks for participating and enjoy your reading! Thanks Stu! I look forward to reviews of what you read. Global Women of Color has a list of 34 books by African women read and reviewed last year. http://gwcbooks.wordpress.com/ And lots more by women of African descent. Been meaning to check out the Global Women of Color. Thanks for the rec. Great! I am very glad you are doing this again. You got me started reading African books in 2012. I will continue to focus my reading on fiction by African women for this year’s challenge. I don’t have a firm list. What I will read depends on which of the relevant books on my wishlist become available. Thanks. And thank you for participating again! I’ll be posting a list on contemporary African lit written by women soon. Maybe you’ll discover something new on the list? Nothing like adding to the wishlists! Great challenge, I’m definitely in! I’ll give it some thought and post my list in my blog post. Thanks for participating and enjoy your reading! I’m excited about this challenge! I’ve read lots of books from Nigerian authors but not many from elsewhere so this will be a lot of fun to complete. I’m going to read all the ones on the “beginners” list, but So Long a Letter isn’t available at my local library so I’ll do some research and find a good replacement. Any recommendations would be more than welcome. Thanks! Entirely different but also written by a woman writer and listed as a classic is Sindiwe Magona’s Living, Loving and Lying Awake At Night. Do see if your library has it. Enjoy your reading and thanks for participating in the challenge!